You are currently browsing the category archive for the ‘Gastronomie’ category. One way to ruin your mashed potatoes is to boil them and then “mash” them with a food processor. This will disrupt the starch bodies and afford a thick, snotty paste suitable for gluing GOP posters to utility poles. Here is a nice way to prepare mashed potatoes. While a pot with a quart and a half of water is coming to boil, peel and cube 4 Russett potatoes. Peel and cube a yam and combine the whole mass of cubed tubers into the pot, bring to a low boil and cover. Yukon Gold potatoes are even better. If you’re feeling less adventuresome, use half a yam. Enjoy a can of Old Chub or a suitable substitute during the process. After 20 minutes of reflux, test for softness. The potatoes should still be slightly firm, but not crunchy. The yams will disintegrate first if refluxed too long. Carefully drain the hot water and add a quarter stick of butter and a half cup of milk. Using a hand held mixer or a hand held masher, mash the light orange mixture to the desired consistancy, adding more milk as needed. Consider what pleasure there might be in a coarse consistancy. Transfer to a large bowl and nestle a pat of butter in the top. To the mound of potatoes sprinkle a light dusting of Hungarian Paprika and serve. Enjoy. Since converting to vegetarianism two months ago I have begun to notice curious bursts of dietary defensiveness in friends, family, and coworkers. First let me say that I am not evangelical about my shift to vegetarianism. Others can eat what ever they please with no lecture from me. I’m happy to discuss this choice if asked, but I generally prefer to remain silent about it. I’m finding that people will quiz me in conversation about the particulars of a vegetarian diet, perhaps looking for apparent contradictions or logical flaws in my response. Some are quick to mark out their meat eating territory so that it is known far and wide that they really dig being an unrepentant carnivore. They’ll ask “if we’re not supposed to eat animals, then why are they made of meat”? Others just shake their heads and marvel at how someone could make such a silly choice. I can’t say how many times I’ve been asked if my choice of vegetarianism was based on some political philosophy or ecological theory. I’ll explain that with my new menu, cycling, and running I’ve lost 11 % of my body weight and am still dropping weight. Yada yada. I’ll ask if they had ever seen my likeness on a Rubens painting and their eyes will glaze over and the topic will turn to the Broncos. Something interesting to do with chick peas- Green Hummus. Place ingredients in blender or food processor and process to a smooth paste. If blending is difficult, add just a dash of orange or lemon juice to loosen the paste for efficient mixing. Enjoy as a zesty spread on a garden vegetable sandwich of cucumber, spinach, tomato, onion, and feta cheese. Don’t be shy with the cayenne. This year we tried Tofurky along with turkey for the thanksgiving meal. While my expectations were low, I have to admit that the Tofurky wasn’t quite as nasty as I had imagined. It is a seitan/soy product textured to resemble meat. Truthfully, in texture it resembles a firm bologna or salami lunchmeat. The package recommends that it be sliced thinly. 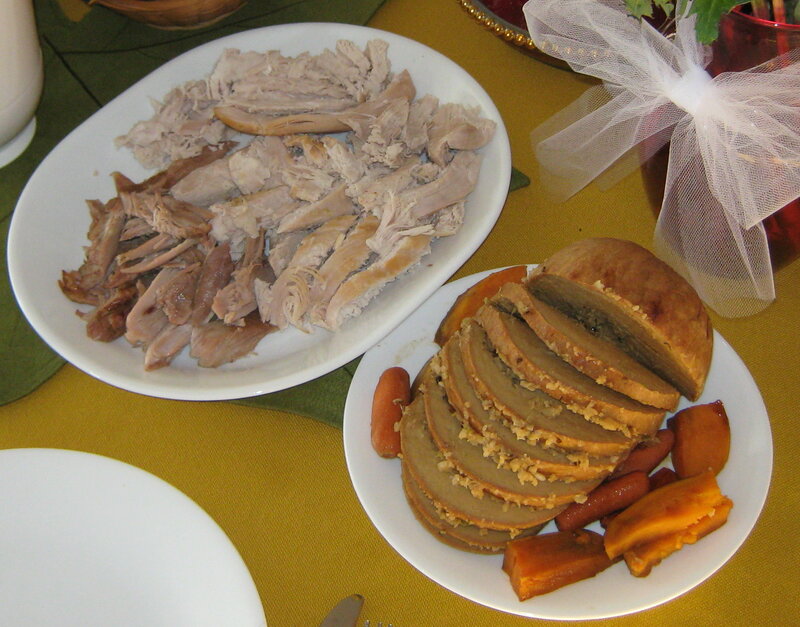 One plate holds a Tofurky. Can you tell which one it is? Buried in mashed potatoes and real turkey gravy, the Tofurky was moderately edible. It is hard to say just how thankful the pilgrims might have been if Squanto had brought Tofurky to the feast. I’ll wager that the soiree would have gone badly. I guess I’m just slow. I finally figured out that you can buy sliced roast beef at the supermarket deli and make a passable Philly Cheese Steak sandwich with very little hassle. Heat a non-stick pan to high heat with a tbsp of oil. Add diced onion, bell pepper and mushrooms and stir fry for 1-2 minutes. Then add a few oz of diced deli roast beef slices with a dusting of seasoning and brown to taste. Collect the meat and veggies to a sandwich sized pile and cover with a slice of cheese. Place a sliced roll or slice of bread over the cheese for a minute while the cheese melts. Scoop the bread covered meat and invert. Like Anthony Bourdain would say- tastes like it died screaming! Drain thoroughly 1 large can of tuna packed in water and add two large dollops of Kraft salad dressing (or mayonaise), a spoonfull of pickle relish, and your favorite mustard (to taste). Take a dozen olives stuffed with pimento and slice them into fifths. Carefully fold the olive slices into the blended tuna mixture. The olives add a saltiness and a pleasing texture to the tuna salad. Enjoy as a sandwich or on a salad. Found a great website for recipes. A prep for Nutella, a chocolate hazelnut spread, can be found there. In the restaurant section, you can find recipes from a large number of restaurants, including Legal Seafoods, Antoines, PF Chang’s, seasonings from Taco Bell, and Crab Rangoon from Trader Vic’s. They even post School Cafeteria recipes. Crimony. Being a scientist, I am interested in natural phenomena. And, being a gastronaut, I am naturally keen to explore the distant reaches of the food universe. Generally my voyages into multidimensional food space are uneventful. But now and then I encounter foodstuffs that push back. Food that does pressure-volume (PV) work on the internals. Some foods are capable of generating many moles of gas phase product that is appreciably insoluble in the digestive fluids. The result is an inflation of the gastric spaces and prompt notice to the brain of distress. Fortunately the good folks at Beano have a commercially available product that in my hands or … ahem … elsewhere … makes a dramatic difference in the discomfort level associated with certain legumes. The secret of this wonder of science is alpha galactosidase. When taken before the first bite of PV generating foods, it causes a drastic reduction in the inflation of the large intestine. This enzyme aids in the hydrolysis of troublesome saccharides that are otherwise left to travel from the small to the large intestine where the gut flora go to town. All the legume eater has to do is to chew 2 or 3 Beano tablets right before the first spoonfull of chili or pintos. In my half dozen live fire beano tests and one frightening control experiment, I have to say that I am a believer. I am grateful and my family is even more grateful. Science for the betterment of mankind. Ya gotta love it. Fellow Gastronauts- As a public service, we are providing a link to an RSC approved recipe for a proper Yorkshire pudding. Be warned before you start that it requires bovine lipids. I’d like to hear from folks who try it. Savoir faire is one of those ethereal attributes that a lucky few are born with and something that most of the rest of us have to constantly work on. The world of sales and business development folk very often involves a business dinner in a fine dining establishment. Very often dinner is a prelude to the next days work, so dining is a great opportunity to get to know the customer. It is important to realize when taking a potential client out for dinner, one is very much under inspection. A client can be put off in many ways. Poor table manners, boorish behavior, poor listening skills, and shabby taste in restaurants can turn the dinner from a plus plus into a minus minus. Here is how you make a big impression on a client. I learned this from a professor at Denver University’s hotel & hospitality school. Go to the restaurant the day before and meet the maitre d’. You introduce yourself and explain that you have an important engagement the next night. Give him/her a business card and a several $100 bills. Explain that you want to be addressed by name as you enter the restaurant. Next, you find the waiter and repeat the instructions. You want to be greeted by name as you are seated. You don’t want their life story, you just want them to be efficient and scarce. Finally, you go into the kitchen and greet the chef. Explain that the next evening is important and ask if he/she has any items that are not on the menu. Thank the chef profusely and go about your business. The next evening after dinner, overtip the staff. Throwing around a few hundred dollars will get peoples attention and should get you a better table and better service. Doing it ahead of time invests the staff in the gig and will be gratefully appreciated. I couldn’t help but reprint this list of Tips on Tipping from Bruce Feiler at Gourmet.com. His 3 page essay on learning how to get a table in a posh restaurant and how to tip in advance is quite well written and should encourage the socially inept to give it a try. Remember, don’t fumble with your wallet fishing for a crumpled note. Have the note neatly folded and ready for a discrete handoff. Show a little style for cryin’ out loud. Go. You’d be surprised what you can get just by showing up. Dress appropriately. Your chances improve considerably if you look like you belong. Don’t feel ashamed. They don’t. You shouldn’t. Have the money ready. Prefolded, in thirds or fourths, with the amount showing. Identify the person who’s in charge, even if you have to ask. Isolate the person in charge. Ask to speak with that person, if necessary. Look the person in the eye when you slip him the money. Don’t look at the money. Tip the maître d’ on the way out if he turned down the money but still gave you a table. Ask for the maître d’s card as you’re leaving. You are now one of his best customers. This Beer Minute is brought to you by Th’ Gaussling and the code ffolk at WordPress. Two half-decent Utility Beers I’ve run into lately are Samuel Adams Winter Lager and Stella Artois. Both are commendable lagers, best taken with a hearty meal and convivial friends. Might I recommend a visit to the Stella Artois website? It is rather entertaining and interactive. This has been a Beer Minute brought to you by WordPress and Th’ Gaussling.